Why do meteorites hate ice-covered ponds? Last Friday, a meteorite allegedly slammed into a Canadian pond, breaking the ice and making a hole over a meter across. Now, it appears this extraterrestrial attack was not the only one. 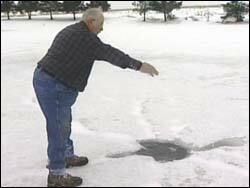 Another icehole was found on a frozen pond, this time in Iowa. Actually, there were three holes this time. The event happened around the same time as the Canadian hole was made, which is interesting. The picture looks very much like the other hit as well: a large hole, with streamers running out from it most likely due to ejected ice leaving tracks in the surrounding snow. There were no footprints leading up to it. Now, a meteorite is not all that crazy; they do hit, and even a small one might leave a fair-sized hole. Iowa is a loooong way from Alberta, so I have a hard time thinking these are related (in that the same parent body broke up and the smaller meteorites left both holes). But it's still interesting. Remember, though, that not everything that falls from the heavens is a meteorite. Funny: a couple of centuries ago no one would have believed stones could fall from the sky. Nowadays they're blamed for everything. Tip o' the Whipple Shield to... Fark! Duh!